But now they have those rotating gifs or vids where the object turns by itself to show off all sides! Or you can rotate it on your own touchscreen! How do they make those? How can we make them so our item will stand out? Again, we need a professional tool for a strictly amateur price! Foldio360 is system for creating those photos. 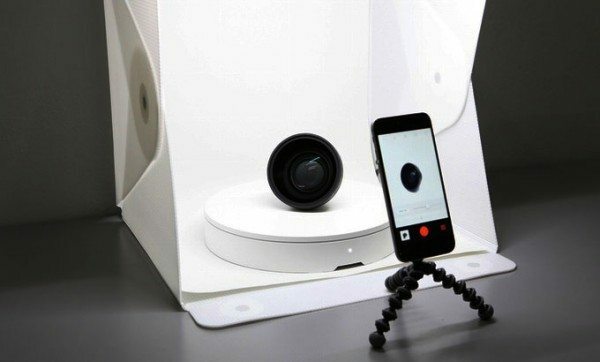 The Foldio360 uses Bluetooth and IR sensors to connect directly with your smartphone or DSLR camera. Open the Foldio360 app, setup your shot, and press start. The Foldio360 system will automatically rotate, take photos and combine them to create one final 360 image. It’s ridiculously simple, but incredibly awesome. You can’t buy it yet, because it is a Kickstarter project. The funding deadline is March 31, and they anticipate shipping in August. OrangeMonkie already has surpassed their funding goal. Their goal was $80,000; they already have $350,000 and nearly 3,000 backers. There are now two primary levels for backers: $89 is rewarded with the turntable and app system itself; $149 also includes the Foldio2 light box. I’ve been burned by a couple of Kickstarter projects where a really smart engineer thinks, “I’ve got a great product! What could possibly be hard about production?” So I’m skeptical. I check the history if there is any. Two years ago, OrangeMonkie created a wildly successful Kickstarter project called Foldio portable photography studio: 3,850 backers pledged $171,764, and it was shipped 3 months after the campaign closed. A year later, 6,729 backers pledged $541,991 for Foldio2, and it shipped in just over 100 days. So I’m greatly reassured. And I’ve backed it! Visit the Kickstarter Foldio 360 campaign page for more info. The one thing that bothers me about this is that your images are uploaded to their website and then you share. Is there a charge for sharing and how long will they maintain this site? The Foldio360 will be able to support a several export file formats such as GIF, mp4, and etc. The online platform can give you an easy way to share the exported file to anywhere at the internet environment for general users. But if you want to use the exported file for your own design, the Foldio360 App can give you the way because it can export the files so that you can use them directly for your needs. The Foldio360 app supports creating 360 photos in the app. And you can save them in your phone or upload it on the Foldio360 website. For DSLR, you need to upload the pictures on the foldio360 website to convert them into one 360 photo. Until now, we have a plan to allow users to do the follow things on the website. We will make it more useful than just a website to store images.